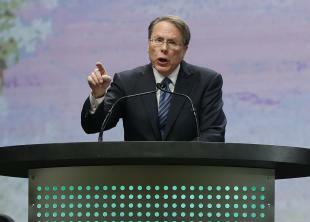 If President Barack Obama successfully drives new gun laws through Congress, the National Rifle Association will fight them in the courts, NRA CEO and executive vice president Wayne LaPierre said in an interview published Monday. “There definitely will be legal challenges,” LaPierre told Field & Stream as part of the magazine’s series on the response to the slaughter at Sandy Hook Elementary School in Newtown, Conn. (Vice President Joe Biden also sat down for a question-and-answer session). The NRA opposes key proposals in Obama’s response to the slaughter at Sandy Hook: a renewed assault weapons ban, universal background checks and a limit on the number of rounds in an ammunition clip. Republicans have signaled that they will oppose the weapons ban, though the fate of the other measures is unclear.